SAN FRANCISCO, CA – This is an exhibition like no other exhibition ever before presented by the de Young museum of San Francisco. In size, it is big. It contains two hundred Mesoamerican artifacts. And it is unique, because many of the exhibited objects had never been seen before by anyone, except the group of archeologists that excavated them from the wombs of the three pyramids in TEOTIHUACAN, the mythical Mexican city that according to the people who came from Aztlan (the Aztecs) was the place where all the gods gathered, at the beginning of the world, to seek the one among them who would lighten it, and be its sun. As we walk through the exhibition observing the artifacts, their intrinsic carvings, their skillful painting, or their elaborate shape or enormous size, seem to possess the magic to be able to transport us back to the TEOTIHUACAN of the lst Century C.E. where all started. An screen projection displays the footprints of TEOTIHUACAN, a city that covered twenty five square kilometers in size and was perfectly planned. The Street of the Dead, that ran from North to South ending at MOON PYRAMID, was its Axis; with another main street running horizontally, in the East to West direction. 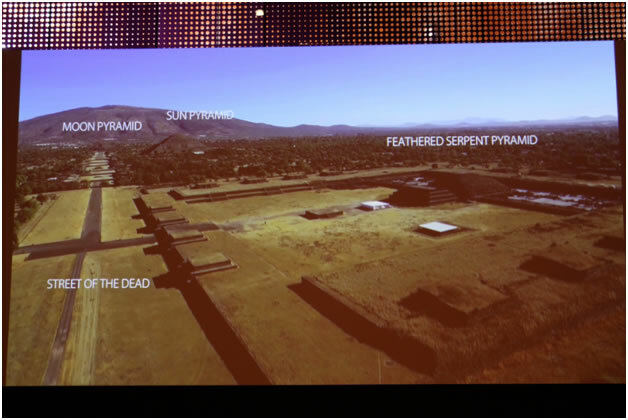 There were two other pyramids in the city: THE SUN PYRAMID and the FEATHERED SERPENT PYRAMID. 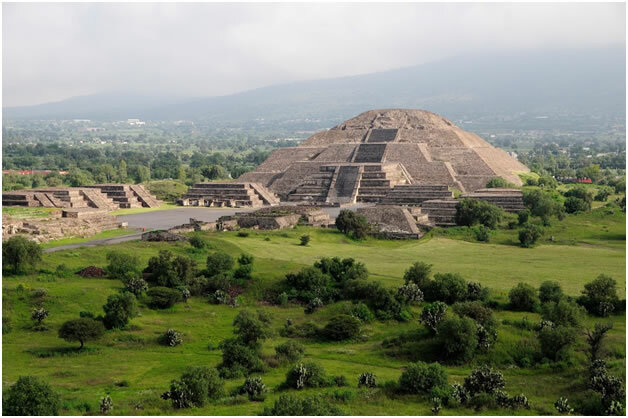 Historically, TEOTIHUACAN was a cosmopolitan city. With around l00,000 to l50,000 inhabitants, it was the most populous city in the Americas, and likely within the top five in the world during the first half of the Christian Era. Among the city’s population were hundredths of immigrants coming from all over Mesoamerica, so one may have heard a myriad of different languages spoken on its streets. 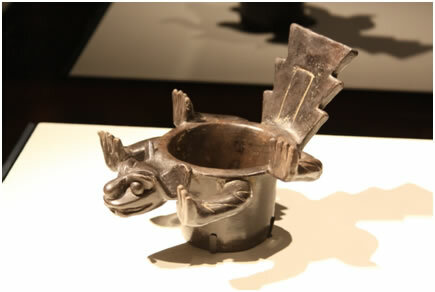 The influx of foreign Art, enhanced the native Art in TEOTIHUCAN, which is described in the history books as "An “artistic city” where art was one of the main means for its citizens to express themselves creating artistic objects that represented their different backgrounds." In TEOTIHUACAN, the glue that bonded its people together was Art. 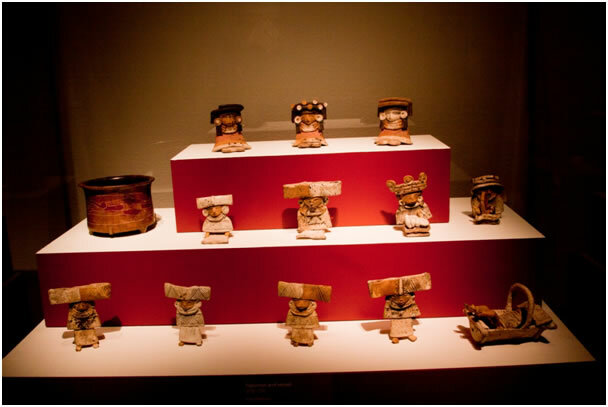 TEOTIHUACAN’s Art and the variety of its inhabitants are represented in the exhibit by a group of flat clay figurines standing about two 1/2 inches high. They were part of a group of 72 other objects, more than half, figurines. that were dug out from a platform that is aligned to TEOTIHUACAN’s city axis, and which is located about two kilometers East of the FEATHERED SERPENT PYRAMID. Their well-preserved color, the different features in their faces and the design of their clothes, document who they were. If we look at them carefully we can notice that each one of them has different facial featues. It is also interesting to mention, that their dresses not only indicate from what region they came from, but also what type of work they did for a living, and their social strata in the society. The majority of the figures are female, which make it easier for a person to identify them because of their dresses. Two of them, (standing in the middle shelf) even have babies placed in front of them. The exhibit also shows a vase, that was found in the same site, and the figurine of a clay baby inside a wickerwork cradle. Every object in the exhibition is a work of art in its multifarious drawings, its colors and is form It may also be "something" for us which needs to be decoded. 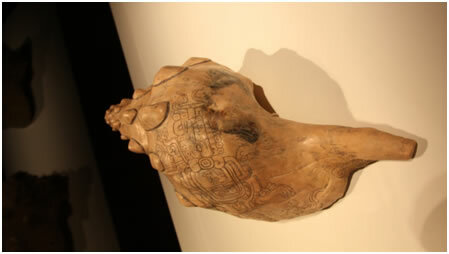 This fragment from a mural drawing, excavated form the compound of Zacuala in l950, is identified in the catalogue as an impersonator of Tlaloc (which in Nahuatl means, He who makes things sprout ) better known as The rain god, In Aztec religion, Tlaloc, was the eight ruler of the days and the ninth ruler of the nights. He controlled the rain, the water, and the lighting in his role as constructor/ destructor, and agriculture, in his creator's role. Carrying a corn in one hand and a pitcher of beans in the other, in the above picture shows Tlaloc in his creator role. This ceramic Effigy vessel has a slightly concave form and its rim is decorated with zoomorphic elements. like the head of an animal, which is difficult to identify, and four protruding arms with four long slender fingers-hands. The animal’s tale has the form of the calendrical glyph XI, one day of the Aztec Ritual Calendar, that takes its name from the serrated tail of the fire serpent. in its body. It is decorated with the finely carving of a floating crocodilian decorated with two hieroglyphic signs in square cartouches. In Mesoamerica a crocodile was a metaphor for the mountainous earth floating on the sea. (As the Aztecs believed that the world was) The shell was used as a trumpet. “The Ancient World’s cradle of ancient development,” as TEOTIHUCAN was called, was also a religious city. It is not in the scope of this article to discuss the AZTEC religion in detail, but we can mention that in the TEOTIHUCAN’s Polytheist Pantheon, lived many gods, and that the most common themes in iconographies and archeological objects in the exhibition that were excavated from the pyramids, found in the compounds and in the ceremonial locations along the Street of the Dead, represented AZTEC deities. Among the most elaborate ones in the exhibition is this small clay censer with an standing figurine with and extraordinary headdress, holding two plates one on each hand It representing the Butterfly god. The Circular Relief (shown below) was found in the Sun Pyramid Plaza. 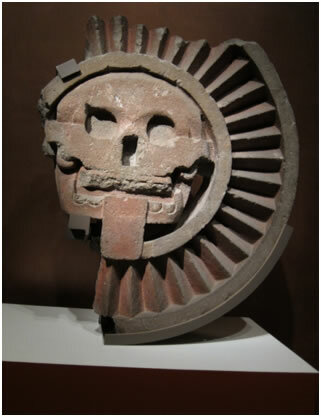 The huge remarkable sculpture represents Miclantecuhtli, the, Aztecs dead deity, which they represented by a skull heashowing its tongue and a long obsidian knife for a nose, (which is missing from this statue, but was inserted in the rectangular cavity) The skull head is surrounded by precisely angled stone carvings. Their gods were also represented in the stucco paintings of the Aztec Murals which adorned the rooms inside their pyramids, which were used as their temples. 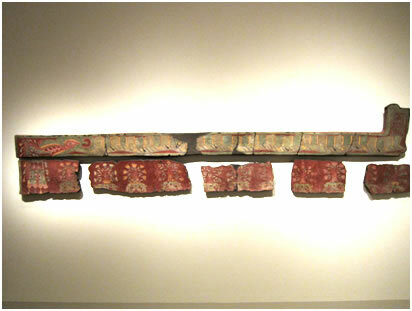 The drawing on the above mural fragments represent the god Quetzalcoatl in one of its first representations as a serpent. In this mural, the serpent is stretched on a red field of stucco slabs, each representing a single flower. The serpent’s body, is formed by rectangular mosaic pieces parallel to each other and painted in different shades of green which were placed on top of an orange horizontal line. To our left, we could see clearly the serpent’s face, his opened eyes and the teeth in its mouth. 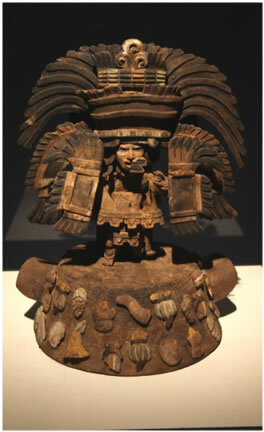 The worship of a god by the name of Quetzalcoatl was first documented in TEOTIHUACAN in the 1st Century A.D. The Early Classic Period (400BC-600 AD) The name Quetzalcoatl comes from a Nahuatl language and means“Feathered serpent.” While the worship of the god by that name was first documented in TEOTIHUCAN in the 1st Century A.D as the god of Wind who wore the wind breast plate around his neck (ehecailacocozcatl) made out of a conch shell, the god appeared in different Mesoamerican religions where he was revered by some as the god of dawn, The god of the Arts and Crafts or as The god of knowledge. 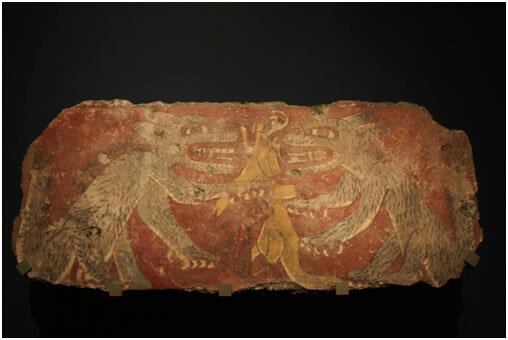 A few venerated Quetzalcoatl as The Morning Star..
Mural fragment. The looseness of the painted line in dark red, suggesting that it may have come from an earlier phase of Techinantila structures. 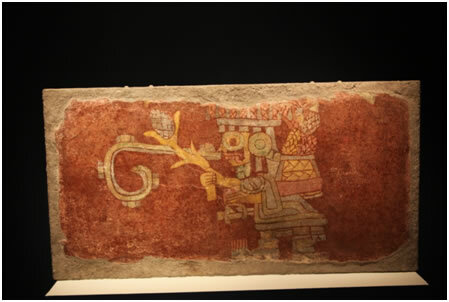 On the mural fragment above, we see Quetzalcoatl again, but this time the double image of the god, shows both their bodies covered with feathers, and the gods having extremities. Both gods show reptile-like upper extremities, but both are using their lower extremities like legs, since both are standing. Through the exhibition we see Quetzalcoatl represented in paintings, in different size figurines, carved in a wood cane, and even in a series of eighteen small obsidian feathered serpents that were used as knives. To those possessing a curious mind, all these representations of a single god may trigger questions such as: Who Was Quetzalcoatl? Was the god a man, or am animal? Did the Aztecs really saw it at one time? or was it just the product of the wild imagination of a single painter? Yet, if the "Feathered Serpent" was imagined by one person, how can we explain its similar representation over and over again in such a multitude of objects of completely different Mesoamerican cultures? As we leave TEOTIHUCAN, CITY OF WATER, CITY OF FIRE we become aware that the whole history of TEOTIHUACAN was revealed to us in those two hundred pieces we saw in the museum, but to be able to understand their grandeur, we must sort all we saw in our minds, and like the pieces of a puzzle, pieced it together. Panel on the Press Preview at the opening of the exhibition L-R Max Hollein, Director and CEO of the FAMSF. London Greed, City Supervisor, Jose Enrique Ortiz Lanz, National Coordinator of Museums and exhibition of the National Institute of Anthropology and History in Mexico City. Dr. Gemi Jose Gonzalez Lopez Consul General de Mexico in S.F. & Mathew H. Robb, Curator of the exhibition. 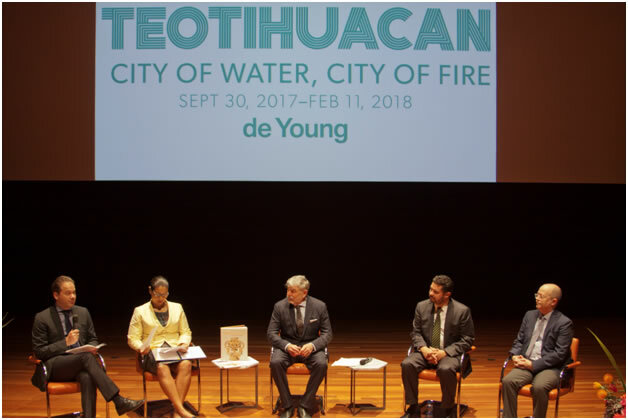 Teotihuacan: City of Water, City of Fire will be on exhibition at the de Young Museum, Golden Gate Park,| 50 Hagiwara Tea Garden Drive, San Francisco, CA 94118 from September 30, 2017 – February 11, 2018. For tickets and information you can go online to https://deyoung.famsf.org/ or call 415.750.3600. The de Young museum is supporting the earthquake relief effort underway in Mexico. For information for supporting this good cause, please go online to https://deyoung.famsf.org/support-earthquake-recovery-efforts.